Barreling south on US-285 is a fine way to learn just how big America is. Traveling by car from Santa Fe to Roswell, at the posted speed limit of 75 miles per hour, will acquaint the Traveler with mile after of mile of emptiness. The village of Encino, New Mexico is your first major stop on the journey. At 2 (two) square miles in area, with a population of 94, it serves as a vivid example of extreme American isolation. America is big. And it is empty. Be sure to start with a full tank. Making the trip in January spares you, Traveler, the rigors of summer heat, but presents unique challenges, not least of which are the white-knuckle, high speed evasive maneuvers around and through patches of snow and ice. Yes, it snows in the desert. The wise Traveler will be ever mindful of cold reality. Your last image of civilization shrunk to a speck in the rear view mirror over 50 miles ago, and cellular service may have disappeared with it. Bring warm clothes. Extra water. Extra food. Flares. Perhaps a firearm. After Encino, the road leads to Vaughn. Larger than Encino by about 200 residents, Vaughn will offer the wary Traveller a choice of two gas stations. Pick one, and gas up. Everything from here is ranch land. County Road 3G, Yesso Creek, Stargrass Road, Bitterroot, One Horse Road. Then, without warning or fanfare, the Sign emerges. Just south of Gallina Road, the Roswell Historical Marker appears. 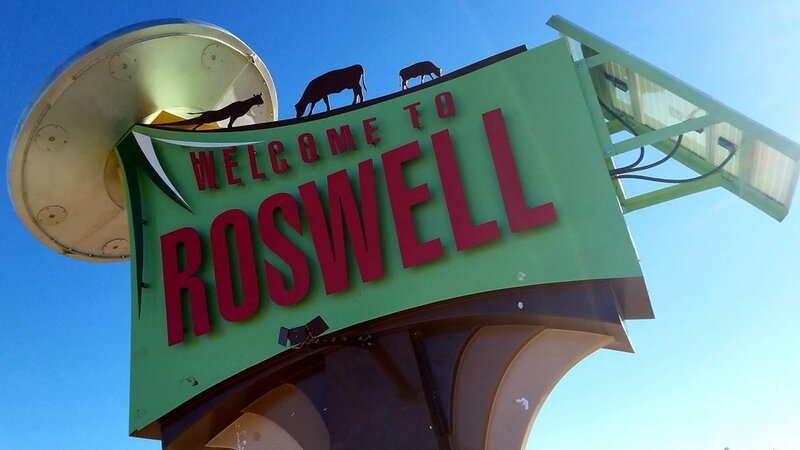 Look lively, intrepid Traveler, for the famous “Welcome to Roswell” sign is only accessible by a small pull-off from the highway. 65 miles-per-hour to dead-stop, on gravel, in 15 feet. Plunging into the heart of downtown Roswell will quickly reveal the kitsch factor. It will seem that no business is immune to the appeal of extraterrestrial gimmicks. From the inflatable green aliens adorning the Super 8 Motel, to the space-themed Galaxy Auto Wash, cheap ploys for the tourist dollar unfold in the style of a military barrage, one after another after another. But the savvy Traveler will head straight for the International UFO Museum & Research Center. The Museum’s displays, largely consisting of reproductions, artists renderings, and long tracts of text, will delight and amuse for a limited time, but the astute Traveler will doubtlessly be drawn to a less-trod wing of the building. The UFO Research Library is the gem of the New Mexico desert. Virtually every book ever written dealing with the subject of aliens, UFO’s, and the supernatural can be found in the Museum’s library. But don’t stop there, Traveler. In the far north corridor, beyond the reading room, you can find the true, beating heart of Roswell. Row after glorious row of meticulously organized, categorized, and alphabetized periodicals. Flying Saucers Magazine, February 1958? Of course they have it. Enrich your knowledge of the unexplained by reading articles such as Weird Objects in Our Heavens in Ancient Times, or Unknown Forces Act on Sputnik. Perhaps you wish to peruse the Borderland Science Research Associates Release #3- A-9, December 1948? Not a problem. Thrill to the eyewitness report of two truck drivers. The two men witnessed a large airplane burst into flames and plunge into Lake Michigan, about a mile off Waukegan. A two hour Police investigation of the area yielded no evidence of an air disaster! The keen Traveler will find their way into the pamphlet section. Hundreds, maybe thousands of independently produced booklets yield hours of bemusement. Take for example “The Message: Part One. November 6, 1994.” This laminated pamphlet promises to cover THE UNIVERSE! THE BEGINNING! THE DINOSAURS! THE COLONIES! No stone is un-turnable at the International UFO Museum. The hopeful Traveler is unlikely to be confronted by true supernatural events in Roswell. 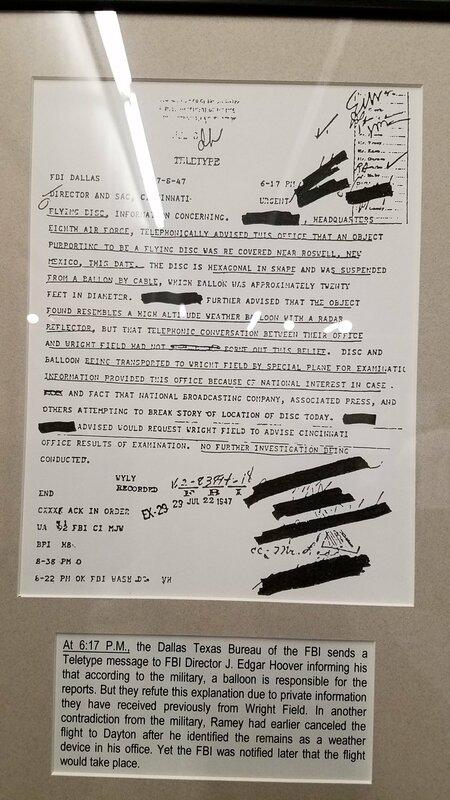 Indeed, you will discover that the so-called “Roswell Crash” did not occur in Roswell at all! Yes, Traveler, you passed the crash site in another New Mexico desert village called Corona, and it was closer to Encino than Roswell. The famous UFO crash took place 130 miles away from Roswell. 130 miles away from the Museum, the dozens of UFO shops, the Super 8, and the Galaxy Auto Wash. The true allure of Roswell is not in the possibility of extraterrestrial contact, but rather in the human inclination for puzzle-building. We crave order so intensely that it is possible for a community to dedicate 72 years - and no sign of stopping - to the collection, combing, classifying, collation, crediting and discrediting, dissecting, discussing, and dreaming about the sheer majesty of seemingly infinite items of data. The puzzle is made of newspaper clippings, photographs, drawings, paintings, bits of metal, minuscule particles of sand and soil, word of mouth, stories passed down, cold feelings in the night, and an unflappable sense of wonder. We don’t even know what the puzzle is supposed to look like, or whether or not it can be solved. We don’t know which pieces belong, or how to fit them. The puzzle has no borders. And the puzzle may not exist at all. So why reckon with such an imposing mystery? You, Traveler, have your own reasons.